For national insurance provider AAMI, personal service is key to its brand DNA. Serving customers in social media channels is a natural fit. In November 2011, the company tapped Ogilvy Group Melbourne for an interactive campaign to launch AAMI’s new page on Facebook. This was its first foray into social media – and it wanted to be able to service its customers and connect with AAMI fans in a 21st century manner. The company wanted to make sure customers had the widest choice of service options, but in order for the brand’s Facebook page to function as a service hub, AAMI needed to first build customer awareness of and engagement with the page. AAMI wanted to promote its page as a customer service tool – it wanted current and potential customers to recognise that AAMI’s premium customer service proposition crosses every channel, including social media. Ogilvy Group Melbourne’s approach was to create a unique experience for fans, combining social media and television. The plan: celebrate the company’s fans by giving them the opportunity to be part of what people love most about AAMI – the ads! An Australian first, the idea integrated broadcast and social media. The story begins with one of AAMI’s recent television commercials for its Safe Driver Rewards program. The TVC starred ‘Rhonda’, a good driver who deserved recognition. It followed, then, that AAMI’s Facebook fans should be recognised too. To this end, Ogilvy Group Melbourne gave people the chance to star in the ‘Rhonda’ AAMI TV spot via Facebook and have their faces digitally inserted into the TVC. Viewers were invited to ‘like’ the page, and enter the competition via a tab. This allowed their profile picture to be exported into the 30-second spot, appearing in place of the existing characters in the TVC. Of the Facebook users who ‘liked’ the AAMI page, 80 were selected based on the number of friends with whom they shared and promoted AAMI. These 80 profile pictures were then digitally inserted into the footage from the original ‘Rhonda’ advertisement. Through a combination of motion tracking and manual manipulation, the competition winners’ profile pictures were superimposed over the faces of safe driver Rhonda’s supporters, creating a remixed TVC populated by the people of Facebook. Painstaking attention to detail went into the selection of images, along with the naturalistic pairing of the motion of the original bodies with their new Facebook faces. The finished product aired on 23 November during NCIS LA on Channel 10, and was broadcast in Brisbane, Sydney, Melbourne, Adelaide, Perth and Tasmania, as well as regional New South Wales and Victoria. The idea was also supported by the Hamish and Andy website, of which AAMI is the sole sponsor. Ogilvy Group Melbourne creative technologist Tim Devine describes the campaign as an elegant fusion of new and established media. “We’ve created an experience that will one day be commonplace. A simple engagement that seams together multiple channels,” he says. The campaign achieved its objective of generating traffic and conversation about AAMI into the social media discourse, and spreading brand-related content across Facebook. Facebook users created more than 4000 AAMI-related stories, resulting in 141,247 Facebook users seeing campaign-related content. 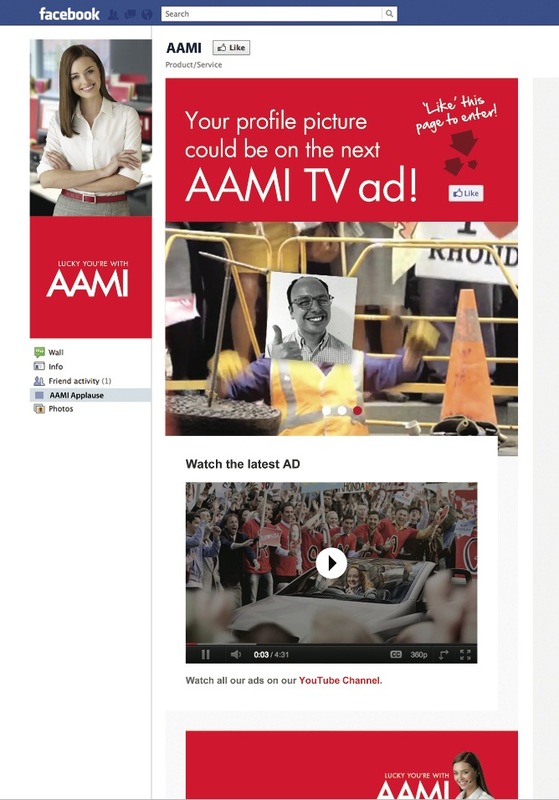 The campaign also prompted 1244 users to share AAMI’s message announcing the custom, Facebookpopulated advertisement. Facebook users also registered their appreciation of the campaign on the newly-established AAMI page wall. 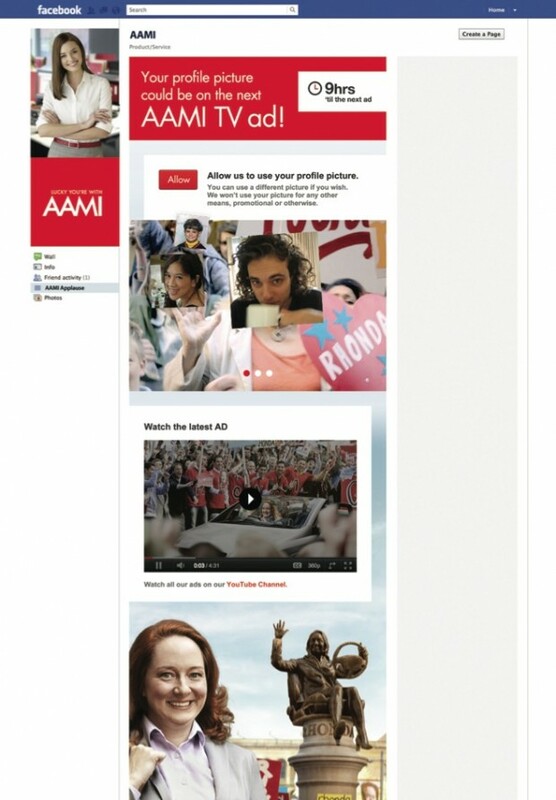 The campaign brought AAMI to Facebook and Facebook to TV. The result? Facebook liked it. 13,119 Facebook app page views. More broadly, the campaign’s significance extended beyond Facebook. AAMI’s executive marketing manager, Richard Riboni, describes the crowdsourced TVC component as part of the company’s wider push into the social media space. “Being the first to do this in Australia made this a really exciting project for AAMI. It’s an innovative way for us to launch our social media presence, and we will be using this campaign to support our full social media offering,” he says.